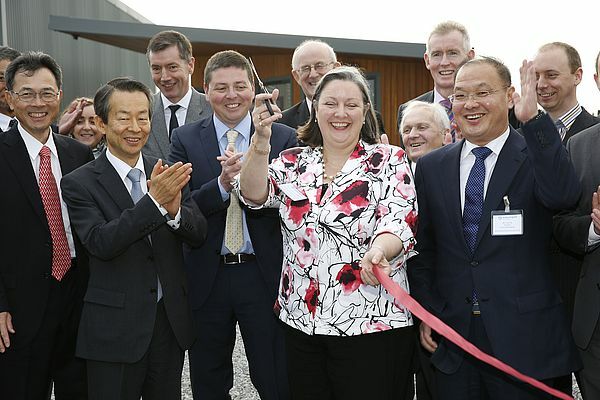 Yokogawa Electric Corporation announces that Yokogawa Ireland, a branch office of the subsidiary Yokogawa United Kingdom, has delivered a control system for Europe's first hybrid energy storage plant in Rhode, County Offaly, Ireland. The hybrid energy storage plant was officially launched and opened on the 4th November by Schwungrad Energie, the owner and operator of the facility. Schwungrad Energie has developed this hybrid power storage system in collaboration with the Department of Physics & Energy at the University of Limerick, and will work with the Irish transmissions system operator to connect the plant to the power grid as a demonstration project under its Smart Grid Programme. The Rhode hybrid demo project comprises of two Beacon Power 160 kW flywheels and Hitachi Chemical valve regulated lead acid batteries of up to 160 kW. The plant will have a maximum import capacity of 400 kVA and maximum export capacity of 422 kVA when completed. The flywheel system, with very high cycling ability, can rapidly absorb short-term excess grid energy and generate energy as needed by grid operators. Batteries can provide energy over longer durations but have more limited cycling capabilities. The hybrid flywheel will assist in disruption mitigation, during times of unexpected demand or sudden changes in energy supply/demand. After the completion of construction, the plant will enter a test operation phase from February 2016. The Schwungrad Energie plant will be the first field test of a hybrid-flywheel energy storage system in Europe. Yokogawa delivered the FA-M3V high speed controller and the FAST/TOOLSTM SCADA software to monitor and control the amount of energy that is stored in the flywheels and the charging/discharging of the lead acid battery. In addition, Yokogawa provided an ExaquantumTM plant information management system that allows Schwungrad Energie to historize and analyse plant data whilst easily transforming this data into usable, high-value, widely distributed information. The company was also responsible for the engineering, installation, and commissioning of these solutions. Backed by this project, Yokogawa will actively continue in its efforts to win orders and strengthen its position in the power industry through the provision of grid-connectable power storage systems and other solutions that can help to build a sustainable society.